The che a p SS stock pot stills so ld here are complete junk. D ont take my word for it, do some reading. Up for sale is a handmade/fully assembled E85/moonshine reflux column for making alcohol, whiskey, rum, vodka, tequila, purified water, etc. If a column isnt this tall it cannot produce as high ABV (alcohol %) as this still. C o mes with all mounting hardware and gaskets as well. PLease note that you cannot use the reducer and have the LM upgrade together unless I install another triclamp break in the column for adding packing. This 3 " column is a 4'-6" total height(height may vary slightly, however performance will not) vapor management still, it is made to fit in an 8' ceiling room while sitting on the keg and a standard banjo burner. This is design has been tested and is one of the best available. This still will produce alcohol in the early-mid 90% range (reflux mode) depending on your skills and how well the column is insulated. It can also be ran in pot still mode by removing the top coil condenser (included but not pictured) and capping the head (no cap included du e to liability). This will allow you to pull foreshots, heads and tails from another port to keep from tainting the hearts, basically keeping your hearts output arm clean. It also has a detacheable SS valve for easy cleaning and storage and a blind port for a 1/8 probe thermometer. You will need is your choice of packing. (rolled SS or copper mesh preferred). (sanke beer keg or any other boiler with 2 sanitary fitting) and. This unit is equipped with 1/2 female npt fittings on the condensers for easy hook up to garden hose or barb fittings for holding tank/pump systems. The top condenser is controlled by a 1/4 valve that is also included. You will need to T into your hose and put a cheap plastic valve if you prefer to save water. I use whatever used parts are available. Quality is our main priority here, you will not be receiving anything other than top notch materials. You will have to run a vinegar/water wash through and toss you first real wash to clean the still. However, you will find this is good practice to get the hang of running one of these. 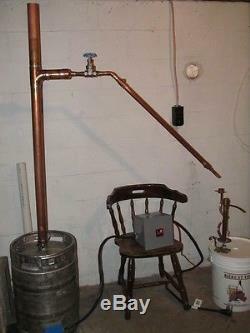 You will also find copper is better than SS for distilling. Commercial sellers use SS because it is much cheaper, they also sell you stills half the size of this one. I will also include brief instructions and info to a place where you can get help and recipes. (per your request as these are pdf's) These are built to order, if there is something you would like to change I. 45 degree down is standard to keep the alcohol away from heat, but can be made to come off like this one at 90 degrees. You can change the height for shorter ceiling, or add the LM upgrade, etc Feel free to contact me for info. There is a 1-2 week wait time as of now. These come uncleaned and unpolished, you will need to run a wash of vinegar and water along with tossing your fist initial run just to be safe. Please check out my other auctions for many other unique items and feel free to ask any questions. The item "3 in 1 Copper 3 column E85 moonshine still alcohol VM LM reflux pot" is in sale since Sunday, July 30, 2017. This item is in the category "Home & Garden\Food & Beverages\Beer & Wine Making". The seller is "schnappstills" and is located in Eureka, Missouri. This item can be shipped to United States, Canada, United Kingdom, Denmark, Romania, Slovakia, Bulgaria, Czech republic, Finland, Hungary, Latvia, Lithuania, Malta, Estonia, Australia, Greece, Portugal, Cyprus, Slovenia, Japan, China, Sweden, South Korea, Indonesia, Taiwan, South africa, Thailand, Belgium, France, Hong Kong, Ireland, Netherlands, Poland, Spain, Italy, Germany, Austria, Israel, New Zealand, Singapore, Saudi arabia, Ukraine, United arab emirates, Qatar, Kuwait, Bahrain, Croatia, Bahamas, Viet nam, Uruguay.